Have you ever had one of those reading experiences where you wonder – is this book difficult or is it just me? Well, I was left feeling that way about Burial Rites by Hannah Kent. This novel, set in Iceland in the 19th century, has been out for a while and has garnered a lot of praise from critics and readers alike. Which is why I was so eager to finally read this. 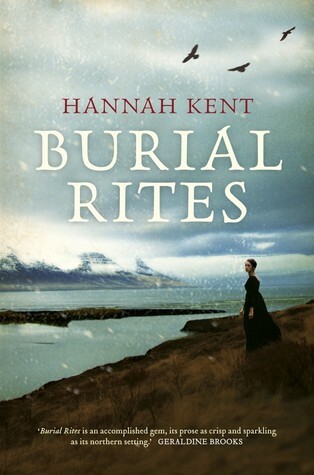 Based on real events, Burial Rites recounts the story of the last criminal to be executed in Iceland – a woman named Agnes who was accused of taking part in the brutal murders of two men.The novel starts at the farm where Agnes is to be brought to serve out her last days on earth before her execution. The family who live at the farm are none too pleased to be saddled with Agnes, but they are in no position to refuse. The mistress of the house and her two daughters soon learn to view Agnes as a person, but no one can be sure if she is guilty or not. What they do know is that life hasn’t dealt Agnes a good hand and she has endured a lot. Thrown into the mix is Toti, an assistant reverend who Agnes has requested to help prepare her for death. Though at first she refuses to speak to Toti, slowly she thaws and piece by piece her story is told and the truth revealed about that fateful night.Toti struggles with the task of bringing comfort to a condemned murderer, not helped by those who see Agnes as a difficult, unlikable woman. Agnes’ story is also told through a series of flashbacks and the text is interspersed with what is probably real historic records from the day. It is a fascinating premise for a novel, coupled with a perfect atmospheric backdrop – all written by a debut author whose use of language makes you think she is someone who has been writing novels for years. So, all great ingredients for a book … BUT I struggled to get through this and in the end I had to sit down and force myself to finish it. I don’t understand why I found a book that everyone raves about so difficult to get through. It just seemed that whenever the story seemed to be gaining momentum, it stopped. I also found it difficult to get back into each time I picked it up. Perhaps it was the prickly character of Agnes, or the bleakness of the story. I don’t know. By the time the story kicked in, I was just grateful to be getting to the end. And once at the end I am not sure what I was supposed to feel, but I felt relieved to be finished. This is all sounding a bit of a negative review. It is not meant to be. I just wanted to like this book a lot more than I did.